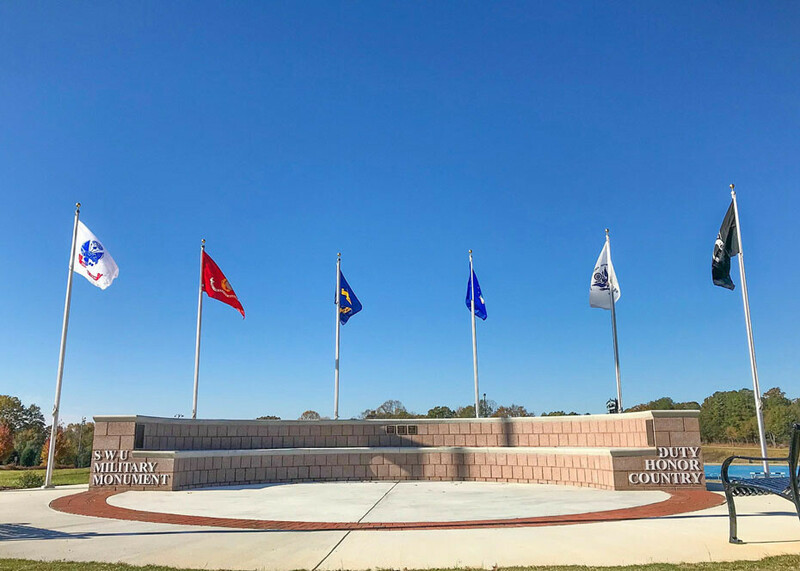 Southern Wesleyan University dedicated its new Military Monument, pictured here, on Nov. 14. The monument, located beside the Sheriff National Guard Memorial Flag Plaza, honors the service and sacrifice of men and women in all branches of the U.S. Armed Forces. 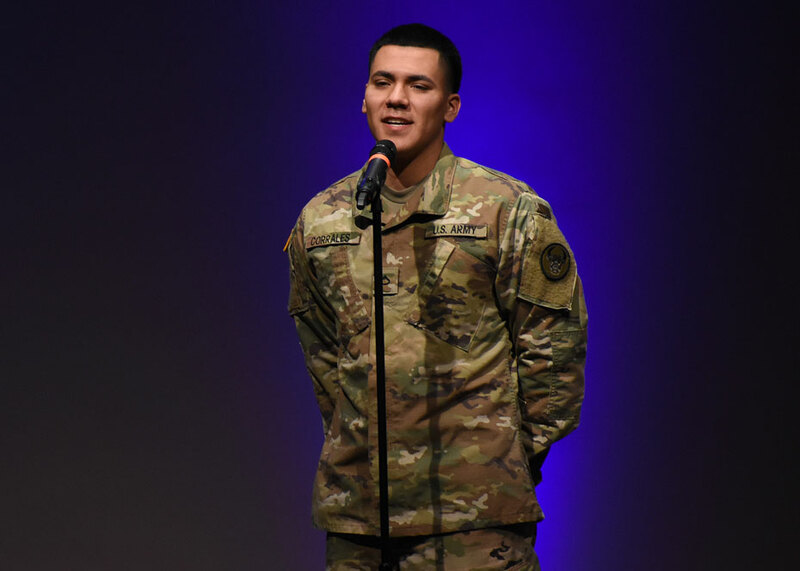 PFC Victor Corrales of the U.S. Army leads in reciting the Pledge of Allegiance. 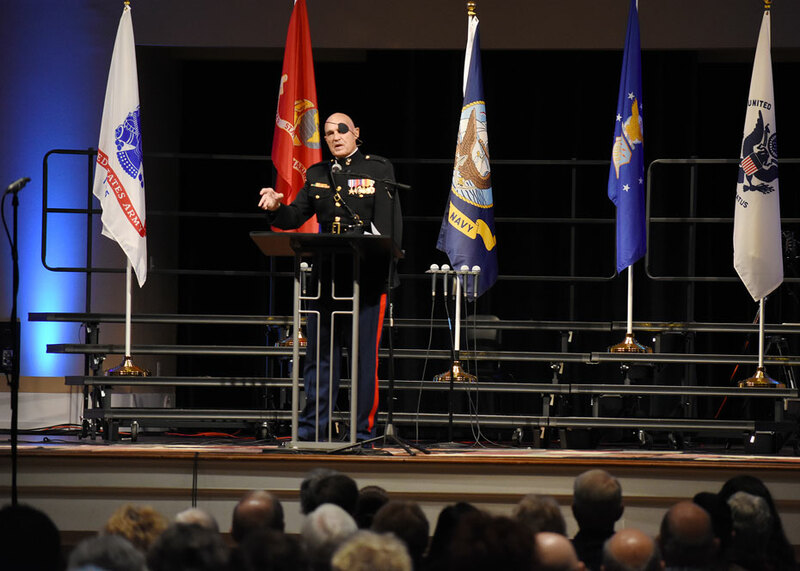 Corrales is a Criminal Justice major from Eden, N.C.
First Lieutenant Patrick C. “Clebe” McClary III, USMC (Retired) was the keynote speaker for a military appreciation chapel and a luncheon that followed. University Singers presented several patriotic selections, including a musical salute to our Armed Forces branches. 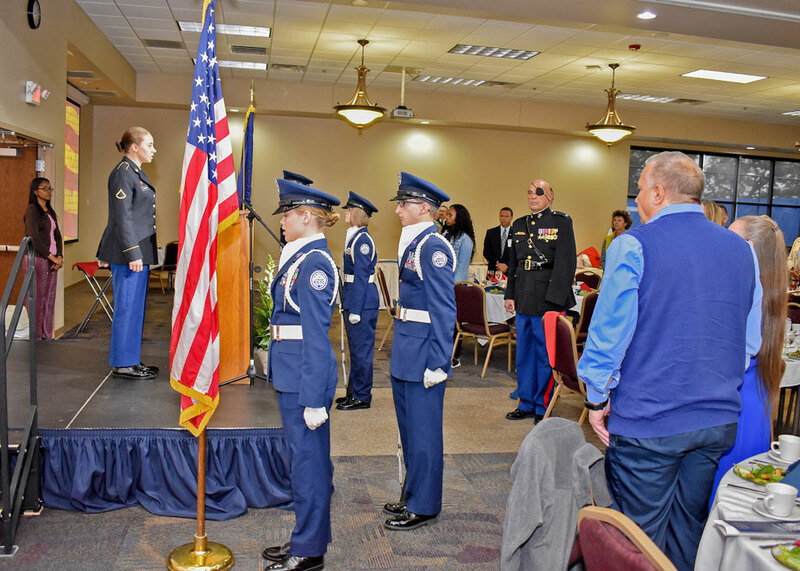 The Daniel JROTC color guard presented the colors during the Military Appreciation Luncheon. SWU President, Dr. Todd Voss, left, and Tony Payne, AVP for development, present a memento of the day to McClary. Dr. Bob Nash talks about how the idea for the Military Memorial got started during a dedication ceremony in The Founders. 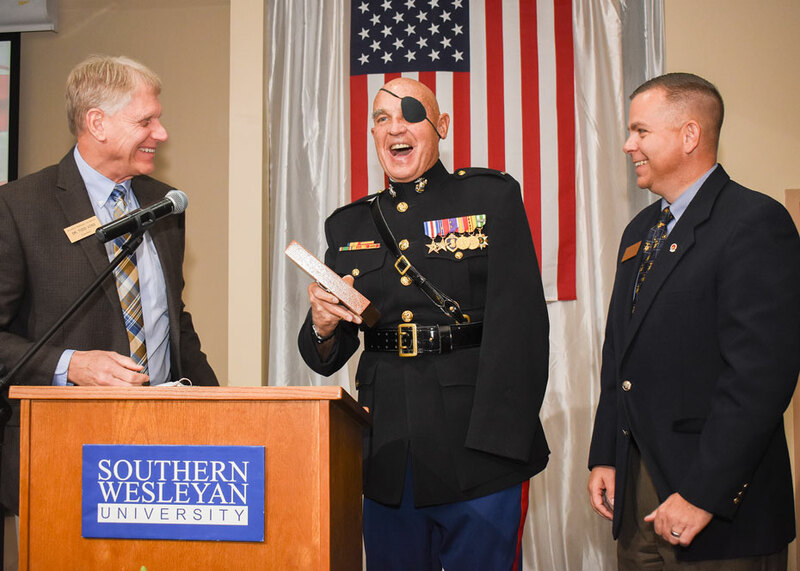 Southern Wesleyan University honored veterans and currently serving military during military appreciation events held Nov. 14 on the Central campus. 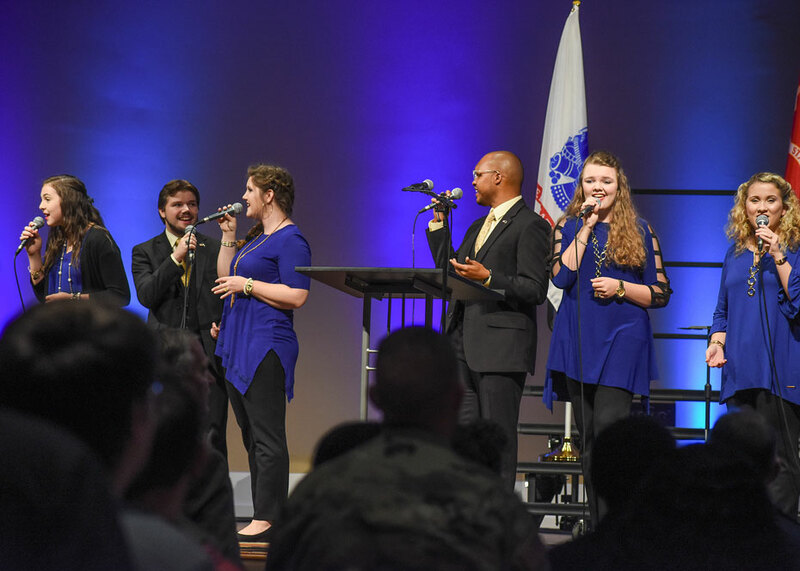 Attending the military appreciation events were veterans of wars in Korea, Vietnam and the Middle East, as well as Southern Wesleyan students and alumni who are currently serving in the military. 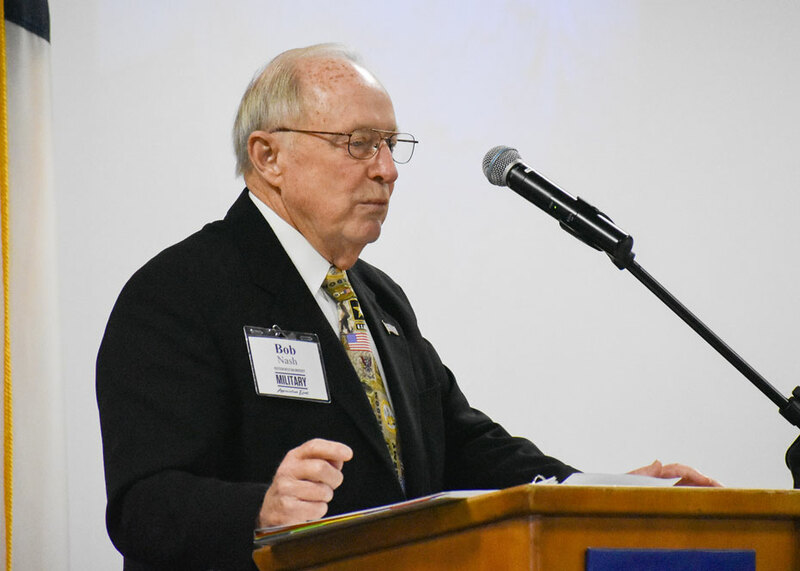 McClary shared his experience of surviving life-threatening combat injuries in Vietnam when his unit was attacked by the Viet Cong, and testified about God at work in his life. McClary has traveled across the nation and in several foreign countries giving his inspirational and patriotic message. He recalled his childhood, remembering how his parents made sure he attended Sunday School and church. In retrospect, McClary said that he “had a lot of religion,” but later realized that he needed a personal relationship with Christ. 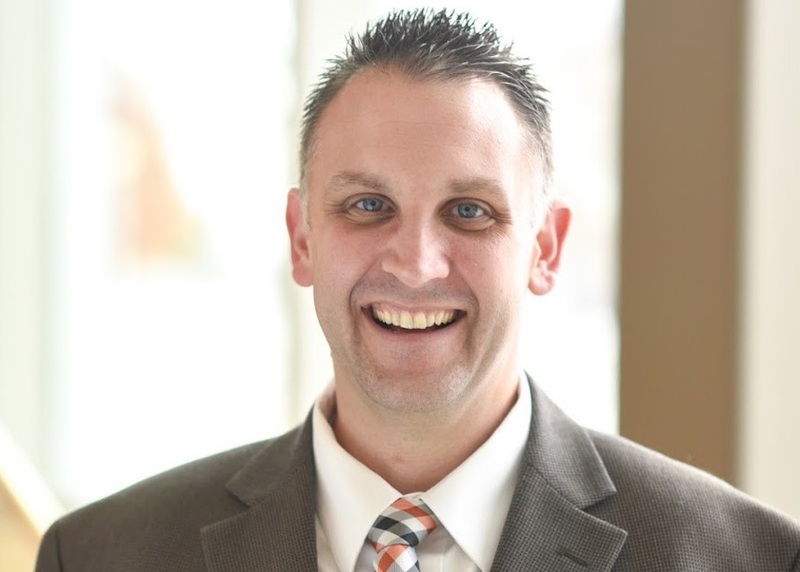 He challenged his audience – composed of veterans, military personnel, students, faculty and staff – to demonstrate Christian character in their lives and to not give up when faced with adversity. Highlights of the day’s festivities included the Daniel High School JROTC presenting the colors at a military appreciation luncheon and the University Singers presenting a repertoire of patriotic musical selections throughout the day, including a medley of songs honoring each branch of the United States military. Dr. Bob Nash, who retired after many years of service to Southern Wesleyan as well as to the U.S. Army at the rank of command sergeant major, had the idea for a place to honor those who have served in uniform. A committee was then formed, and, with design input from University President Dr. Todd Voss and the efforts of retired Physical Plant Director Jonathan Catron, physical plant staff and others, the monument was completed in early November. On the monument will be placed bronze plaques for loved ones living or deceased who are Southern Wesleyan alumni or relatives, as well as current or previous faculty or staff members with documented military service. For details on ordering a plaque, visit www.swu.edu/giving/military-monument or contact Southern Wesleyan University’s Office of Advancement at (864) 644-5006 or email . Southern Wesleyan holds a military appreciation event annually on the second Wednesday of November. Military appreciation events were organized by the university’s Advancement Office with valuable assistance from the university’s Veterans Support Services, Academic Records, Office of Marketing, Pioneer College Caterers and the Warriors Baseball Team. For details, contact the Office of Advancement at (864) 644-5009. 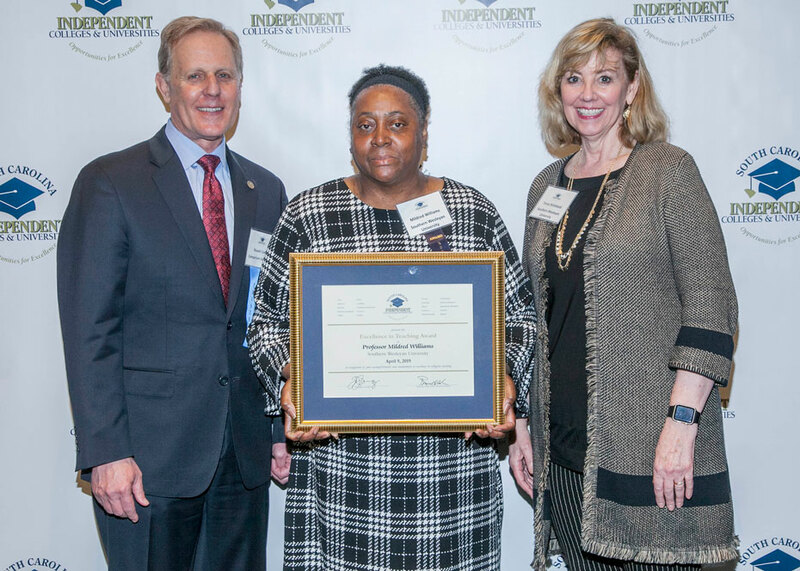 For details about Southern Wesleyan’s commitment to the educational success of veterans as a Military Friendly School, visit swu.edu/military or contact Donna Pittman, VA benefits administrator, at or call (864) 644-5536. Southern Wesleyan University is a Christ-centered, student-focused, faith-filled community that offers inventive learning experiences. The university endeavors to prepare its students to be dedicated scholars and servant-leaders who impact the world for Christ. At the same time, it’s Southern Wesleyan’s desire to practice contagious generosity within the surrounding community. For details about degree programs, go online to swu.edu. There will be two ceremonies – a 10 a.m. ceremony for on-campus graduates and a 3 p.m. ceremony for online graduates. 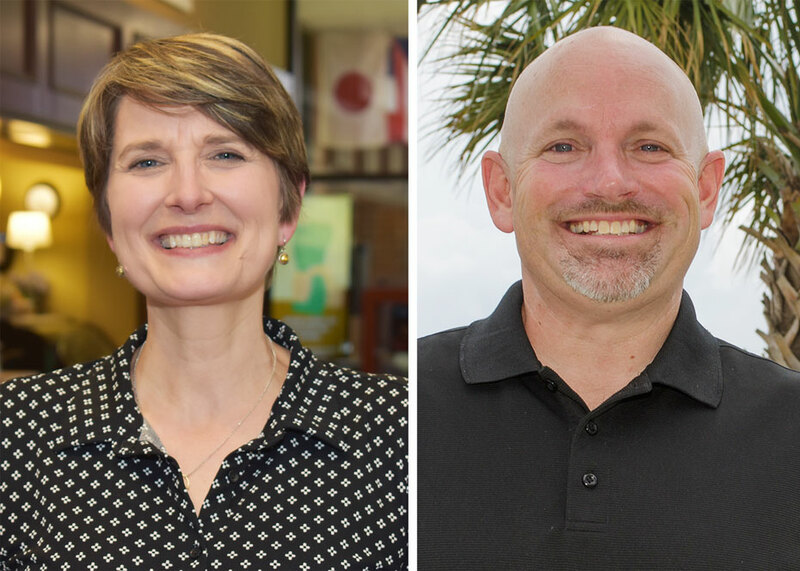 “Professor Williams is a shining light of hope and support for students, faculty and staff." SWU President Todd Voss.